Sermons on the Last Days expand and explain a passage of Scripture from 2 Timothy 3:1-9, which looks at the changing nature of our world. The Bible says, “You can be certain that in the last days there will be some very hard times. People will love only themselves and money. They will be proud, stuck-up, rude, and disobedient to their parents. They will also be ungrateful, godless, heartless, and hateful. Their words will be cruel, and they will have no self-control or pity. These people will hate everything that is good. They will be sneaky, reckless, and puffed up with pride. Instead of loving God, they will love pleasure” (2 Timothy 3:1-4). What is wrong with our world? Why is there a growing tension in our changing world? Let me make two observations concerning verse one. 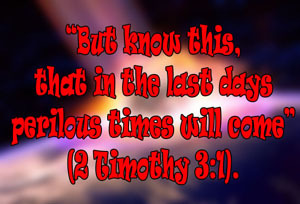 The last days refer to a period of time between the first and second coming of Christ. Therefore, we are in the last days. In the last days, perilous times will come. To put it simply, Christians will face difficult times as the return of Christ nears. In fact, these difficult times will intensify as the return of Christ nears. In other words, don’t be alarmed, Paul said to Timothy, when difficult times come upon the church. What will characterize these perilous times? How will we know these perilous times are upon us? You know, whenever I read that passage of Scripture, I think to myself: That describes the world to a tee. That’s the world we live in! Why is our world decaying morally? There are two reasons. Look at the beginning of verse 2, “For men will be lovers of themselves...” And now look at the end of verse 4, "...lovers of pleasure rather than lovers of God." I get the impression from verses 2 to 4 that the focus is man not God. If there were one characteristic of the world today, it would be this, man is in; God is out. Our society has banished God. We have banished God to the peripheral. Our society doesn’t want God. We have rejected God’s values and man has formulated his own moral values based on his needs and wants. In short, we do what is right in our own eyes rather than what is right according to God. That’s why we live in perilous times. Let’s face it the world is dictating her values because we love ourselves rather than God...our focus is man rather than God. These people who are morally bankrupt have a form of godliness but their lives deny God’s power. Who is Paul talking about? He is talking about false teachers. Teachers who are corrupt and peddling their corruption. Paul said to Timothy, “From such people turn away” (3:5b). In Timothy’s day, people would prey on the weak and vulnerable. That is, false teachers would go into people’s homes (especially, the weak and vulnerable) and seek to lead them away from the truth. False teachers still do this todays. They come promising the truth but never delivering. I think we can usually spot them pretty well straight away. Let me also say, false teachers don’t always come in a suit and tie, carrying a briefcase. There is another subtle way that false teachers creep into our homes. Yes, you guest it! The multimedia has subtly crept into our homes exchanging truth for lies and lowering our moral standards. It is a real concern! In the Old Testament, people opposed the truth; so too in the New Testament people will oppose the truth. We see that now in our world and sadly in the church. God’s word is being replaced by man’s preferences. These people who propagate moral and truth decay will be exposed. They will not win the day. We who follow Jesus and who are faithful to God will win the day. Yes, we live in a changing world and at times it looks bleak. However, we have great opportunities to lead people to the truth of Jesus Christ. Let's not forget that we are on the winning side.